At Boulder First Aid we offer complete, customized on-site First-Aid Services for the Industry in British Columbia. 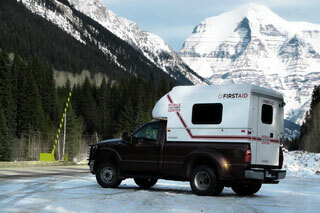 OFA Level First Aid attendants with many years experience working in high-risk, remote job sites. Highest quality TufPort MTC's (mobile treatment centers) available today, meeting all applicable safety standards (roll over protection, seat belt anchorages, engineered frame mounting, etc.) mounted on low mileage, heavy duty 4 x 4 F350 pickups. The MTC units (designated by the WCB to take the place of a standalone industrial ambulance plus a dressing station) are equipped with hot/cold running water, light and heat and are a requirement for remote job sites in high-risk work places with more that 10 people in BC. Equipped to the 'first aid room' standard set by the WCB and meet the requirement for up to 200 workers in remote high risk job sites. We supply an AED (automated external defibrillator) at no additional charge. $20/day. Calls $1 per minute. Call us today to discuss your onsite first aid services needs. 1.250.672.2120. Onsite First Aid MTC unit.